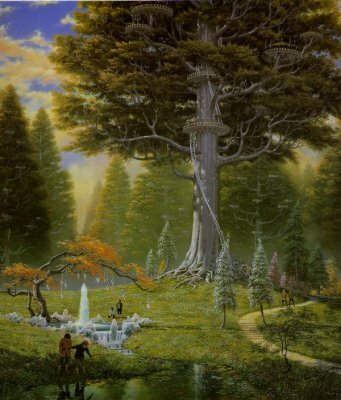 Have you ever wanted to live in Lothlórien? Now you can be one step closer to having your own part of the Golden Wood. The beech tree is very similar to a Mallorn. 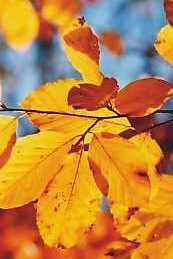 It has smooth, grey bark and in the winter, the leaves stay on the trees, and have a golden color. It has low branches, so you can even build a flet on it if you want to! Height … Both American and European beeches grow to 50 – 60 ft. Spread … 40 – 70 ft.
Leaves … Glossy green leaves, are about three inches wide and are oval shaped with a point at the end. Turn gold colored in the fall and do not fall off until winter. Seeds … There are one to three nuts inside a bur. Growth … Slow to Medium. Grows less than 12 inches a year. I hope this information will help you if you want to make your very own Lothlórien! More detailed information can be found at various horticulture websites. I’ve been trying to figure out what was most similar to a mallorn. beech never occurred to me. thanks!